Many of the so-called ‘lost’ paphiopedilums resulted from the deliberate misrepresentation of their true location in order to protect the collector’s source. For example, P. rothschildianum was said to come from New Guinea when its actual home was Borneo. For others it was just bad luck or bad management! 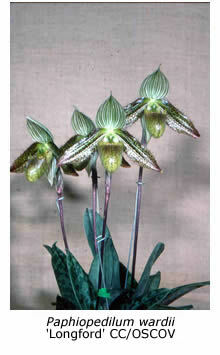 Paphiopedilum fairrieanum is one of the most easily recognised of the Asian slipper orchids. Its white dorsal sepal has undulating lateral margins and is marked with purple and green veins, while its down-swept petals have parallel purple and green stripes and up-swept tips, often likened to the horns of a water buffalo. John Lindley named the species from a plant flowered by a Mr. Fairrie (or Fairie) of Liverpool in 1857. There was some uncertainty as to its country of origin and that of a few other plants of the same species that flowered over the next year or two, although Bhutan and Assam were given as the most likely sources. In the 1880s the nurseryman Frederick Sander sent one of his collectors (Forsterman) to northern India with instructions to find more plants of this highly desirable orchid but there was no sign of P. fairrieanum, although he found many other orchids, including Paphiopedilum spicerianum. By 1905 only five small plants of P. fairrieanum were left alive in the whole of Europe. And so in 1904 Sander offered a reward of £1000 to the first person to send him the elusive orchid, together with exclusive information regarding its source. Obviously he hoped to be able to collect more plants and make enough money from their sale to cover the incredible reward and to make a profit as well. Within a year an English engineer, Mr. G.C. Searight, had sent Sander, via an Indian nurseryman (a Mr. S.P. Chatterji), several large plants of P. fairrieanum from Assam and claimed the reward. However, other plants almost simultaneously arrived at Kew Gardens and elsewhere. It seemed that the ‘secret’ location of the lost slipper was no longer a secret – in fact it transpired that the ‘lost’ slipper had been found even before Sander had offered his reward! Within three months Sander was able to offer 179 plants of P. fairrieanum for auction but the highest price paid was 21 guineas and the total shipment brought in only £550. Fortunately for Sander he had sold his best plants privately at much higher prices before the auction sale and it was later claimed that the “luck over the fairrieanum” resulted in a profit of £5000 and saved the firm from another of its regular financial crises. Because Searight had allowed plants to reach Britain from other sources, he was paid only half the reward originally offered, but even so £500 was a very large sum in those days. By the end of that year another 800 plants were being offered for sale in Darjeeling and the price had fallen to a few shillings! Paphiopedilum species vary widely in their distribution. 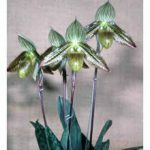 Paphiopedilum insigne is widespread throughout northeast India and Nepal, while Paphiopedilum rothschildianum occurs only on Mount Kinabalu in Sabah on the island of Borneo. Paphiopedilum curtisii (syn. P. superbiens) is also very restricted in its distribution. The following account of its initial discovery and subsequent rediscovery is that recorded by Frederick Boyle in his book The Woodlands Orchids, published in 1901, although some dates and detail have been amended in line with Arthur Swinson’s later book, Frederick Sander – The Orchid King (1970). Paphiopedilum curtisii was first found in 1882 by Charles Curtis, an orchid collector for the famous British nursery of Veitch and Sons. Curtis did not reveal where he found the plants, other than in Sumatra, and soon after resigned to take a post as Director of the Botanic Gardens in Penang, Malaya. P. curtisii was highly regarded by British growers and consequently the price rose rapidly as soon as the initial shipment had been sold. In 1887 the rival firm of Sander and Sons therefore sent a new employee, the Swede Claes Ericsson, to Sumatra with instructions to follow Curtis’ trail and find the source of Paphiopedilum curtisii. It sounds an impossible task, following a five-year-old trail through the jungle, but Ericsson managed to trace Curtis’ movements throughout Sumatra for several years, finding and shipping back to England a wide variety of orchids in the process. Not that it was easy. The natives in parts of the high country were very partial to Europeans – they ate them!! They especially liked missionaries – two Americans, three French priests and two Dutchmen were eaten before the ruling Dutch authorities forbade further travel in the region. Ericsson had explored elsewhere and was sure that Paphiopedilum curtisii must grow in the mountains inhabited by the cannibals. He obtained official approval to accompany an armed party seeking reprisals against the cannibals, but all to no avail – the elusive slipper orchid was still nowhere to be found. Next he was given permission to accompany a party to a government sanatorium on Selimbang Hill near the capital Padang. It is unclear whether Ericsson himself was ill and seeking rest and recreation or whether the excursion was simply a further opportunity to seek orchids within the safety of a large party. In any event he was lying in bed in one of the communal dormitories in the sanatorium on the morning after arrival, idly amusing himself by attempting to decipher the verses and cartoons on the walls (we call them graffiti today), when a drawing of a slipper orchid caught his eye. Could it be Paphiopedilum curtisii? The accompanying caption “C.C.’s contribution to the adornment of this room” confirmed that Charles Curtis had also slept there and that surely Paphiopedilum curtisii must grow nearby. With great expectations Ericsson and his native assistants set out next day, finding many orchids but not the elusive Paphopedilum curtisii. Day followed day without success until Ericsson began to worry that the orchids they had already collected would deteriorate unless they were shipped soon. Eventually one of the locals he had hired to help in the search returned with a flower of the prized slipper. Within a couple of days they had collected several thousand plants, which were successfully shipped to Sander in England – Ericsson’s long search was over. In 1922 Frank Kingdon Ward, a professional plant and orchid collector, was crossing a mountainous area of Northern Burma (now Myanmar) while returning from an expedition to China. Along part of the trail he collected a single paphiopedilum plant in flower. Unfortunately, this plant was lost during the following weeks of the trek. However, Ward vividly remembered its beautiful chocolate-coloured flower and the general location where it grew and was determined to find more plants. In 1926 he was again in the general area but despite spending considerable time searching the hillsides along the trail he was unable to find any plants. Over the following years Kingdon Ward continued to search for the lost slipper whenever he passed through the region but it wasn’t until November 1931 (during flowering season) that he found a number of flowering plants spread over a much wider area than expected. These plants were collected on his return journey a month later and shipped to England where some of the plants flowered in 1932. The orchid was named Cypripedium (Paphiopedilum) wardii after its discoverer. However, this was not the end of the story. 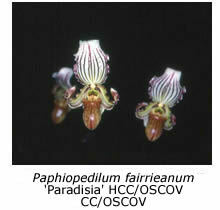 Due to the small number of plants initially collected, P. wardii remained extremely rare in orchid collections. In December 1979 Fred Thien Pe, a dedicated orchid botanist from Yangon (Rangoon) University, arranged a one-month plant hunting trip to Kachin State in Northern Burma to search for P. wardii. 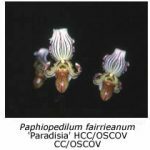 In his view this was “still the most coveted treasure among paphiopedilum lovers” (The Orchid Digest, 1981, 98-103). Just getting approval and funding was no easy task as this location in northeast Burma was at the time “a wild, remote, heavily malaria-infested, insurgent area in which no botanist had set foot in many decades”. Fred Thien Pe described that part of the route near the Chinese border as “so hard and so dreadful” that one of the members of the expedition was forced to return to base. After a fortnight of privations that included crossing treacherous terrain, wading fast-flowing rivers and a cuisine of delicious jungle cat stew, Fred Thien Pe and three others eventually found a number of P. wardii plants either in bud or in flower. After four weeks he had amassed a valuable collection of plants and was happy to return home to his beautiful wife, his daughter Vanda and son Dendro (these are their real names, no kidding! ).